This year we planted a cucumber plant below our new plum tree, so we could watch cucumbers hang from the tree. 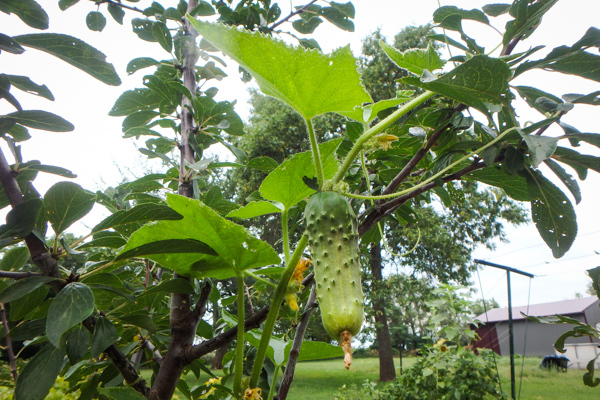 It makes a perfect support for the cucumbers, and they grow straight when they hang. 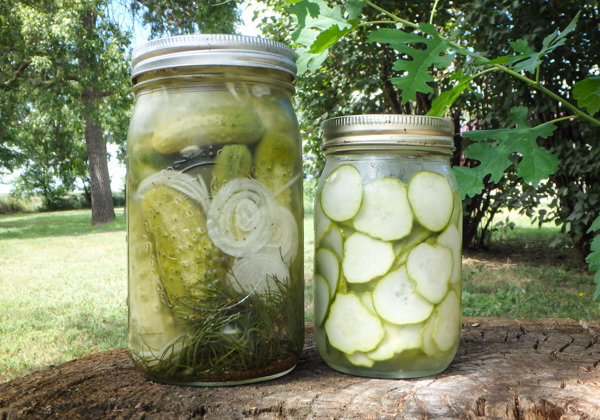 On this page are varieties of sweet pickles you can make from all those cukes in your garden. The first couple of recipes below are Refrigerator Pickles, and you can use them through the winter. Below them, are some Bread and Butter pickles that can be canned. Boil 2 cups of water, pour it in a bowl, and add the sugar and salt to dissolve. Wait for it to cool. In the meantime, clean your quart jar, and put in the dill and garlic. 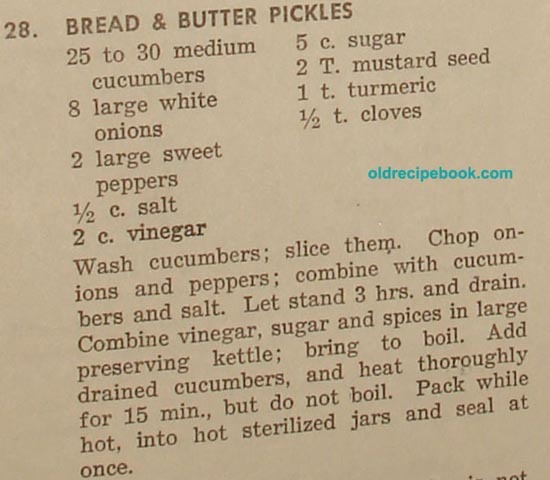 Then put in your cucumbers, either whole, sliced, or chunked. Add the celery seed, add the cooled brine to the top to cover all, and put on a lid. Shake it up, and put in the refrigerator. Should be ready in a week. 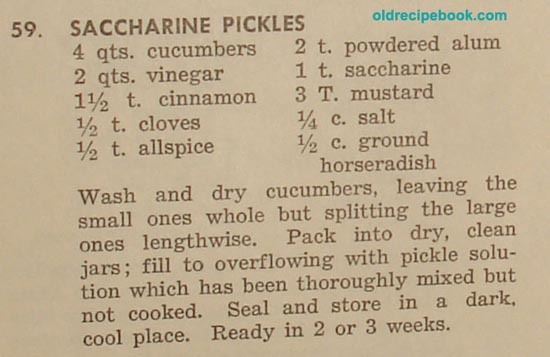 My Note: If your cucumbers are bitter, this recipe won't work. This is a picture of the Semi-sweet Refrigerator Pickles I made this year. It's pretty much a Refrigerator Dill, but slightly sweetened. The pint jar holds extra juice that I sliced a leftover cucumber in. Combine all ingredients; mix well. Place in jar, refrigerate. The pickles will be ready in 24 hours and will keep up to 6 mo. Cut cucumbers 1/4 inch thick. Chop garlic fine. Put in large bowl. Sprinkle with salt. Mix well and let stand 2 hours. Meanwhile, mix sugar, vinegar and pepper. Do not drain cucumbers. Add vinegar mixture and mix well. Can be eaten next day. Keep in refrigerator. Slice unpeeled cucumbers (small) into jar. Cover with above mixture. Refrigerate for 5 days before using. Shake every other day. They will keep up to 9 months in the refrigerator. Bring to a boil and cool. Pour over sliced cucumbers and onions. Let stand in the refrigerator. -Put dill in bottom of jar, using the amount you desire; then pack the cucumbers in the jar, and put more dill on top. -Add 1 c. cold water, 2 T. salt, 1 T. sugar and fill jar with vinegar. -Seal and shake until salt and sugar are dissolved. 1 large jar hamburger dill pickles (cheapest you can find) Drain vinegar from these and let them set in the colander all day. Stir 2 or 3 times daily for next 3 days. Combine cucumber and onion slices in large bowl. Layer with salt and cover with ice cubes. Let stand 1 1/2 hours; drain and rinse. Place remaining ingredients in large sauce pot and bring to a boil. Add drained cucumbers and onions and return to boiling. Pack hot 1 1/2 pint jars, leaving 1/4 inch head space. Remove air bubbles. Adjust caps. Process 10 minutes in boiling water bath. Yield about five 1 1/2 pint jars. Cover cucumbers, onions and salt with cold water and ice cubes. Set about 3 hours. Do not use metal container. Mix sugar, etc. and simmer 30 minutes. Pour cold water off cucumbers, pack in jars; cover with hot liquid. Process 10 minutes. Put the sliced cucumbers and sliced onions into large pan and sprinkle the 1/2 c. salt over them; then cover with chipped ice or ice cubes and let stand 45 min. Drain and add to the boiling hot liquid mixture, and heat just 5 min. ; then fill into sterilized jars and seal. They should be stirred up thoroughly when put into the hot liquid. Seal hot. 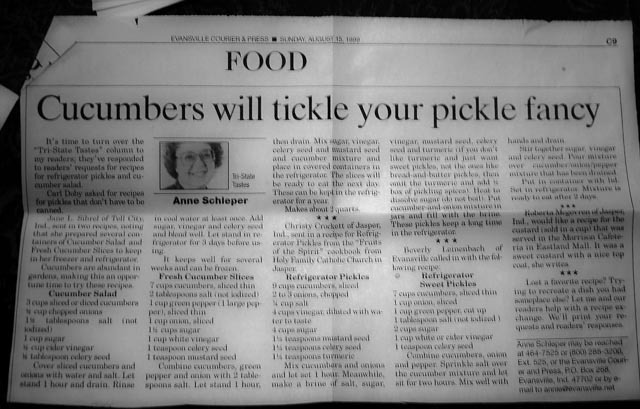 (Cucumbers may be peeled, if desired). Wash cucumbers; slice them. Chop onions and peppers; combine with cucumbers and salt. Let stand 3 hrs. and drain. Combine vinegar, sugar and spices in large preserving kettle; bring to boil. Add drained cucumbers, and heat thoroughly for 15 min., but do not boil. Pack while hot, into sterilized jars and seal at once. - Let stand 3 hrs. and drain. 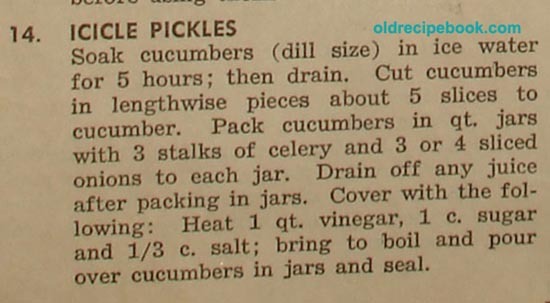 This recipe uses 25 to 30 medium cucumbers. Let cucumbers and onions stand in the salt-brine for at least 2 hours. Then drain. Add cucumbers and onions; cook until transparent. Add about 1/3 t. alum to each qt. jar. Seal hot. Wash and dry cucumbers, leaving the small ones whole but splitting the large ones lengthwise. Pack into dry, clean jars; fill to overflowing with pickle solution which has been thoroughly mixed but not cooked. Seal and store in a dark, cool place. Ready in 2 or 3 weeks. 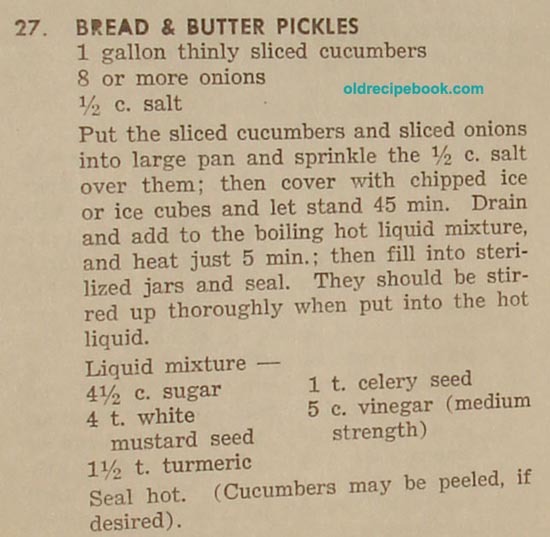 Recipes in a 1999 newspaper by Ann Schleper which includes Fresh Cucumber Slices, Refrigerator Pickles, and Refrigerator Sweet Pickles. I am adding the first recipe called Cucumber Salad because it can be stored in the refrigerator or frozen. Cover sliced cucumbers and onions with water and salt. Let stand 1 hour and drain. Rinse in cool water at least once. Add sugar, vinegar and celery seed and blend well. Let stand in refrigerator for 3 days before using. It keeps well for several weeks and can be frozen. Soak cucumbers in ice water 5 hours. Cut each cucumber lengthwise into 5 strips. Pack closely in 3 hot sterilized quart jars, with 3 stalks of celery and slices of onion in each. Drain off any juice. Bring vinegar, sugar, water and salt to a boil. 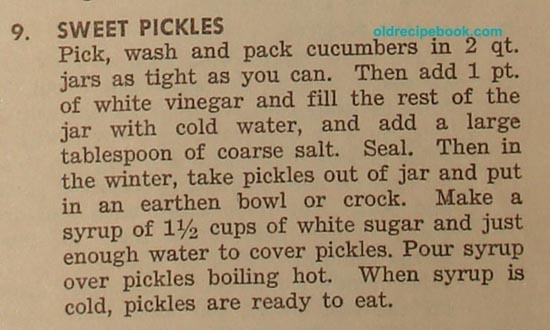 Pour over pickles in jars; seal at once. Process in boiling bath (212 degrees) for 5 minutes. Makes 3 quarts. Wipe four quarts small unripe cucumbers. Put in a stone jar and add one cup salt dissolved in two quarts boiling water and let stand three days. 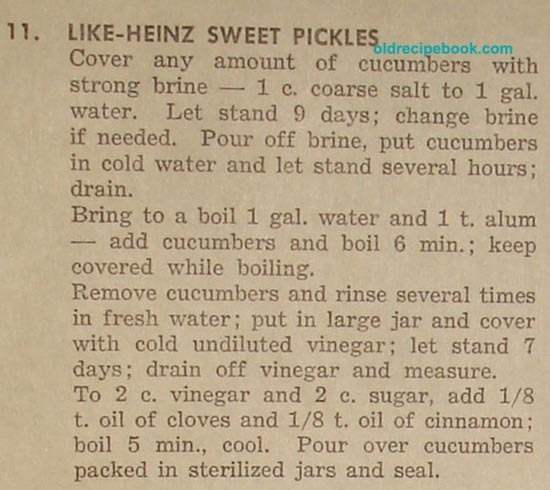 Drain cucumbers from brine, bring brine to boiling-point, pour over cucumbers, and again let stand three days; repeat. Drain, wipe cucumbers, and pour over one gallon boiling water in which one tablespoon alum has been dissolved. Let stand six hours, then drain from alum water. Strain remaining liquid over pickles which have been put in a stone jar. 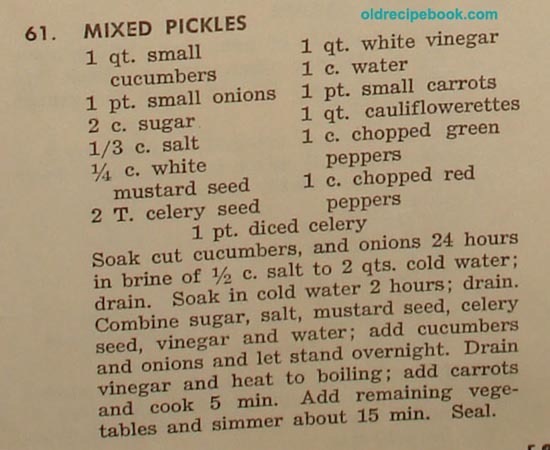 Wash pickles and slice, then put in cans. Put 2 slices of onion and 1 head of dill on top of each can, then fill with heated syrup and put in canner and cold pack for 5 minutes. Wash cucumbers and cut into chunks, enough to fill 4 quarts. To each jar add 3 or 4 slices of onion, 2 pieces of celery and 2 head of dill. Dissolve sugar and salt in vinegar and water; bring to a boil. Place cucumbers in jars, then cover with hot sugar, salt, vinegar and water. Seal at once. For best results, do not use for 30 days. Makes 4 quarts. Pack cucumbers tightly in jars. 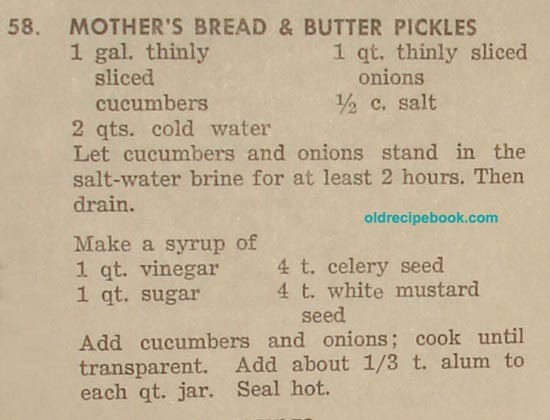 Put 2 slices of onion, 1 teaspoon spices and 1 teaspoon salt in each jar of pickles. Mix together vinegar, sugar and water; bring to boil and pour over pickles. Cold pack 7 minutes after water starts to boil. Soak in water and 3 teaspoons salt for 2 hours, then drain. Heat syrup until sugar is dissolved, then cool. Put cucumbers in freezer containers, cover with syrup and freeze. Sliced Sweet Dill Pickles - These cukes can be peeled or not. 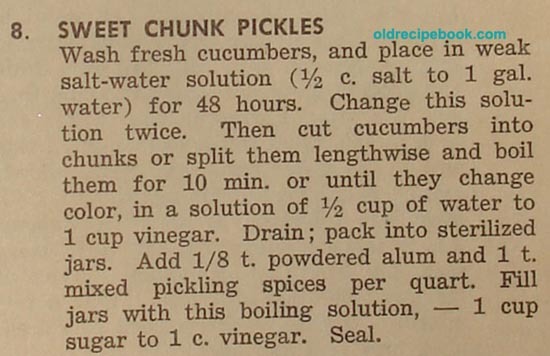 Sweet Chunk Pickles 08 - This recipe seems rather difficult. You have to change the brine twice within 48 hrs. B's Chunk Pickles 60 - Chunk cucumbers and pour boiling water over them and let stand 5 min. Put into jars and mix, heat and pour over them: 1 qt. water, 1 pt. vinegar, 1/2 cup salt and 1 c. sugar, and dill. Seal. This sounds like an easy recipe. I like to make several jars of chunk for my potato salad recipes. Sweet Pickles 09 - This recipe wants you to pack your pickles, and in the middle of winter, take them out of the jars, and THEN make them sweet. Interesting! 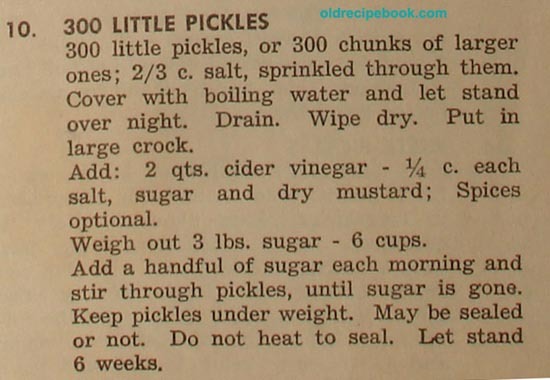 300 Little Pickles - This is a "crock" recipe for tiny sweet pickles or chunks! Wow! 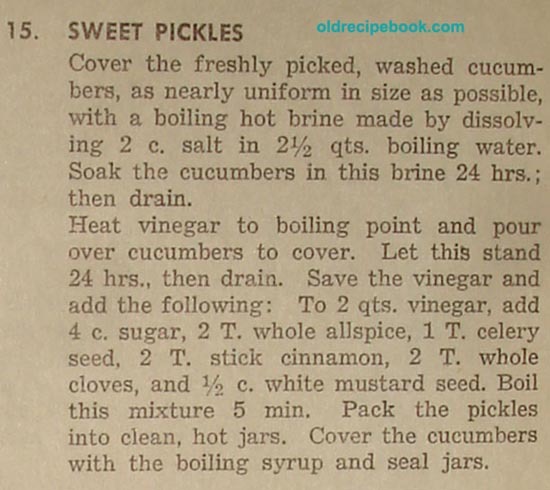 Like Heinz Sweet Pickles - This is a 16 day recipe for sweet pickles. It also uses oil of cloves and oil of cinnamon. 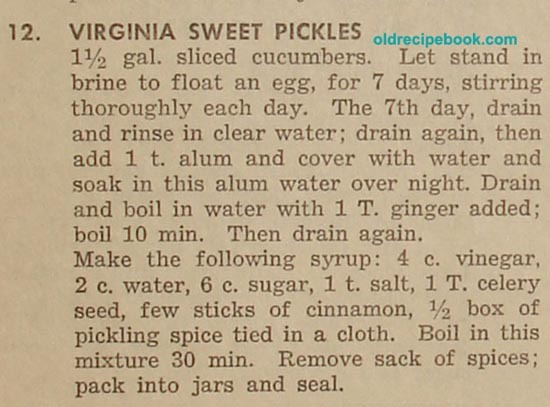 Virginia Sweet Pickles - This recipe takes 7 days. 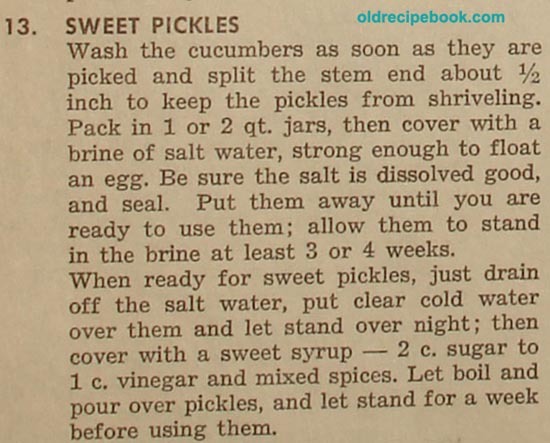 Sweet Pickles - This recipe wants you to split the stem end about 1/2 inch to keep the pickles from shriveling. Stays in brine 3 or 4 weeks. Icicle Pickles - Soak cucumbers (dill size) in ice water for 5 hours, then drain. Cut cucumbers in lengthwise pieces about 5 slices to cucumber. Pack cucumbers in qt. jars with 3 stalks of celery and 3 or 4 sliced onions to each jar. Drain off any juice after packing jars. Cover with the following: Heat 1 qt. vinegar, 1 c. sugar and 1/3 c. salt; bring to boil and pour over cucumbers in jars and seal. Sweet Pickles - Soak the cucumbers in a hot brine for 24 hrs first. 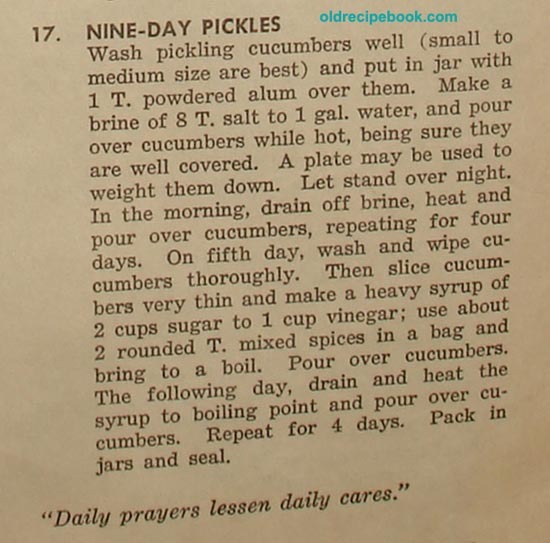 Nine Day Pickles - This is an extensive recipe that takes 9 days in which you have to drain the brine, boil and soak them again. Wow. I probably will never make this recipe. Diet Sweet Pickles - Very simple recipe that uses sweetener. 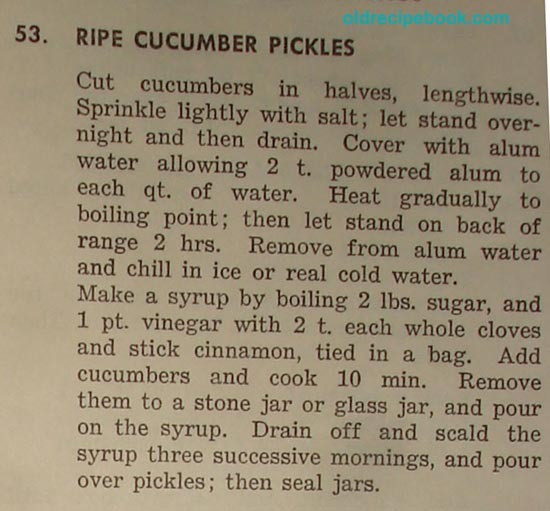 Ripe Cucumber Pickles - Here's another recipe I will probably never make. Plus it calls for a lot of Alum. Sweet Mixed Vegetable Pickles - A variety of vegetables canned in a sweet syrup. Canned Sweet Peppers - Very easy recipe for canning peppers.